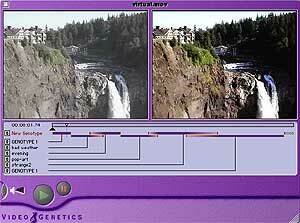 The latest digital imaging product from Q-Research, VideoGenetics, automates digital video enhancement. Through a simple interface, the powerful, patent-pending genetic image optimization engine is used to make complex imaging adjustments easier, without requiring a technical user. By simply allowing the user to decide what looks best, VideoGenetics software converts the images to reflect the preferences of that particular user. In addition to the new Evoca 170SE 35mm camera and three Advanced Photo System cameras, Samsung has added four new digital cameras to the Digimax line, ranging in price from $199 to $1,019. 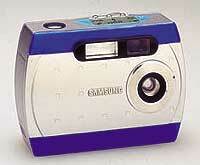 The most unique is the Cybermax 35 MP3, a digital camera that has an MP3 player built in. It can also be connected to your PC and used as a web camera, for live video teleconferencing over the Internet. It has a 640 x 480 resolution, optical viewfinder and both USB and serial interfaces. It uses CompactFlash memory for storage and has 2 megabytes of internal storage. It retails for $289.